Svankmajer is renowned for his groundbreaking and innovative use of stop-motion animation in his films. Many of his surreal short films comprise mainly of his experiments in this medium. Recent works however, have seen Svankmajer experimenting more with live action and a more restrained use of stop-motion animation. Little Otik is one such film. Svankmajer imbues his animated creations with so much life and character, more so in fact than those of his human/live action characters. Indeed Little Otik seems to highlight this trait of Svankmajer’s and even steps it up a notch. The human characters are drawn with the broadest of stokes, however the writhing mass of roots and twigs that make up the ‘baby’ evokes pity and, initially, maybe even some sympathy. Not since Eraserhead has parenthood seemed like such a nightmare. To begin with, the fussy neighbours assume that Karel’s odd attitude is due to his anxiety about becoming a father. He is portrayed as an ineffectual man, highlighted by his infertility and inability to impregnate his wife. 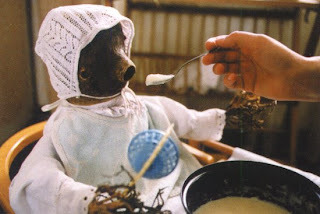 Svankmajer seems to have stripped the human condition down to two things: to feed and to breed. When Karel presents Bozena with the stump of wood, he seems to be offering her the hope of fulfilling her heart’s desire of becoming a mother. He only succeeds in pushing her further towards insanity. Somehow, in Karel’s absence, Bozena gives life to the piece of twisted root and even suckles it. The scene where Karel returns to their cabin to witness this is eerily tranquil and more than slightly disturbing. His impotent burst of violence only pushes Bozena to compel him to face up to his responsibilities as a father. And it would seem that he wearily accepts his task after all. Initially it isn’t made clear whether or not ‘Otik’ is actually alive, or if it is just a case of two sad and desperate people allowing their imaginations and fragile minds create a child for them. The opening scenes unfold as the brittle couple envision babies everywhere in their day to day lives. From the startling image of Karel carving open a melon to reveal a baby inside, to the more comical images of mothers and their prams blocking the street in their abundance. Svankmajer soon makes it clear that Otik is indeed alive and constantly craving sustenance. It is the two unfortunate parents of Otik that eventually become the monsters however. Having reared the creature for so long they eventually abandon it in the cellar of the house when it begins to become ‘difficult’ and too many people have started to go missing. In the latter half of the film, events veer into overt horror-film territory as Otik begins to feed on living things, first of all a cat and then on people, staring with a postman and an interfering social worker. Svenkmajer is strangely careful to represent Otik in a specific light. While a bloodthirsty monster, the creature is still a wayward infant in need of care, attention and guidance. There is a touching moment when the young girl from next door brings Otik some food and toys and washes his roots in a basin full of water before he eats, as he gurgles contentedly. She mutters to herself that his parents ‘deserve to be punished’ for the way they’ve treated him. As unsettling as his appearance is (all swarming roots, bundles of spindly twigs and branches with a hideously toothed mouth and wrapped in baby’s clothes), Svankmajer still shrouds him with a touch of humanity. Svankmajer’s unsettling obsession with food and images of eating and digestion continue throughout Little Otik as they did in his earlier films. He renders the whole process of eating and consuming food a mindless, futile and ultimately distressingly greedy routine. No one in this film has their appetite sated, no matter what it is they crave, be it a family, a meal or an intimate caress. Waves of nausea emanate from every scene involving mealtimes as we are bombarded with close-ups of mouths slobbering and queasily chewing food and slurping down liquid. As you watch the grotesque events unfurl, you may become aware that a deeply troubled expression has crept across your face and nestled there for much of the film’s duration. A haunting piece of work, with startling imagery, pitch black humour and food for thought.